Classified as Art & Crafts style, this home was designed by Wade Hampton Pipes and built in 1936.
the lack of eaves. The steeply pitched roof descends behind a facade of the exterior walls and pours into a hidden gutter system which feeds into carefully placed downspouts with urn-like, tapered rainwater heads. The house is of wood frame construction and is faced with stucco or rough cement. The exterior finish is severe and without ornamentation. bays, a light wood molding on the side elevations of the dormers projecting in the upper half-story on the garage, and a signature panel, surrounded by stepped moldings for the placement of the house number above the recessed entry for the front door. The fenestration is regular with casement windows, each of four rectangular lights laid horizontally. The original fenestration consisted of single panes of glass (four lights per casement) set in opening steel casements. With the passage of 54 years, however, the casements rusted, expanded, and shattered the window panes. In 1989 the house had dozens of cracked and broken windows. Thus, the current owners, have removed all of the existing windows (save one in a weather-protected, exterior stairway to the basement) and replaced them with double-glazed, wood with metal-clad finish, casement windows which replicate the original, horizontal, four-light design. The present treatment has restored the fenestration to its original appearance yet met weatherization standards. This house is of irregular shape, consisting of a primary rectangle—the full, two story volume—and an ell, a two story to one and one-half story wing which contains the double garage on the street level. Pipes experimented with this rectangular shape as early as 1929 in his design in the Better Homes Architectural Competition. That house was rectangular with a hip roof and, significantly, enclosed the gutters within the exterior walls. Pipes retained these elements in the Bates house of 1935, but departed from the Georgian elements of the 1929 competition submission. He moved the chimney to one side, used a plain hip rather than a bellcast hip roof, persisted in his preferred use of casement windows rather than double-hung sash, and made no use of quoins. The design of 1929 suggested, perhaps, Pipes T interest in English Renaissance sources, but his commitment to the Arts and Crafts philosophy of minimal ornamentation emerged strongly in his rendering of the Bates house (Clarke 1985:46-47). (Clarke 1985:38-39). This bay permitted Pipes to experiment with interior spaces and add variety with little suggestion on the exterior of the impact of such a design. The first story of the Bates house consists of an entry hall with stairway to the second floor, living room, dining room, kitchen, and bath. The living room is of rectangular shape and fills the entire south side of the main floor. It has a fireplace with a simple, narrow mantle. The dining room is the most interesting space on the main floor. The room is octagonal and uses the projecting three-sided bay on the east elevation to good advantage. The kitchen, the only room in the house to have any alteration, is now one space. Originally there was a kitchen and small breakfast room. Doors open from the dining room into the garden and from the kitchen onto a patio. A staircase leads from the main floor up to the two-bay garage, and another staircase descends to the full basement. bedroom is situated on the floor above the dining room and a standard bedroom is situated above the kitchen. An upstairs bathroom is adjacent to a staircase leading to a fourth bedroom above the garage. This bedroom has dormers on the north and south elevations. The Bates house has quality materials throughout: hardwood floors in all rooms, deeply cut moldings, and waist-high wainscoating finished with moldings, built-in bookcases, the linen closet, and brass hinges and pulls. The house has excellent integrity of fabric, spaces, and materials. original plantings of bulbs and a magnolia which grows on the south elevation. house contains features common in Pipes' designs of the 1920s and is not visible from the Bates house. and minimal exterior decoration in the 1930s. His turning of the window lights to the horizontal, hiding of gutters, and clean designs in this period are characteristic of the Bates house. His overall concern with spaces, attention to interior details such as bookcases, linen closets, moldings, and wainscoating are consistent with his commitment to the ideals of the Arts and Crafts Movement. it has no rating assigned by the Portland Landmarks Commission Wade Hampton Pipes played a unique role in the development and execution of Arts and Crafts architecture in Oregon in the twentieth century. "Wade Pipes was a man out of time: a free spirit living in uneasy truce with a technologically obsessed society," observed Pietro Belluschi. "He began as a skillful craftsman and became an inspired designer with a flair for good composition and fine detailing," continued Belluschi, "uncompromising in his principles and adamant in what he thought to be appropriate and beautiful." This former dean of the School of Architecture of Yale University concluded: "Personally and belatedly, I must admit to a feeling of admiration for Wade Pipes, for what he was—a shining example of rectitude, talent and wit—also to a feeling of envy for his personality, for his authentic detachment from the cares and worries which were so much a part of our daily practice of the time" (Clarke 1986:ix). These comments confirm the stature and unique significance of Wade Pipes. Further, Ann Brewster Clarke, has lifted up the full chronology and controlled repertoire of the life works of this figure in Wade Hampton Pipes: Arts and Crafts Architect in Portland, Oregon (1986). She has focused upon his residential designs and their relationship to an international architectural movement: Wade Pipes' primary legacy, however, is the group of houses he designed between 1911 and 1961. Together they form a body of work significant for quality of design and construction, variety within a discipline, and an evolution of style that kept pace with the approach of modernism. They are the best examples in Portland of English Arts and Crafts architecture. They are a testament to the lesson of William Morris: not to copy, but, following his principles, to create (Clarke 1986:xvi). monitored the work of the carpenters, masons, painters, and others, and ultimately produced a finished work, virtually a work of art. A houseconceived and created with such care, observed Clarke, achieved distinction as a "handmade object" (Clarke 1986:7-8). architecture, furniture design, and landscaping in their commissions between 1900 and 1930. Adam Clark Vroman, photographer and bookstore owner, extended the commitment to artistry and quality in his stunning platinotypes and albums of views of the missions and the Indians of the Southwest (Makinson 1977, 1979, 1988; Anonymous 1904, 1905). Pennoyer a judge of the second, judicial district. Martin L. Pipes subsequently engaged in a lengthy practice of law in Portland and, presumably, possessed the resources to sustain his son's four years of study in Great Britain (Carey 1922:377-378). John Montague Bates and Elizabeth (Geiser) Bates were close friends of Wade Pipes. Their acquaintance commenced in the 1920s and resulted, in part, from the friendship of Bernice . (Dodson) Geiser and Susie (Fennel) Pipes. On August 27, 1925, John M. Bates married Elizabeth Geiser in the garden of the home of John and Susie Pipes overlooking the Willamette River in the Sellwood District of Portland (Bates 1989). The garden, designed by Wade Pipes, was singled out in 1919 in The Architect and Engineer of California as one of the "Three Most Notable Examples of Landscape Architecture in Portland." The house, constructed in 1912, was Pipes' first commission in Portland. Ann Brewster Clarke has written of it as "an excellent example of Wade Pipes' articulation of Arts and Crafts principles: incorporation of house and landscape, clean and simple design, materials and workmanship indigenous to the environment" (Clark 1986:31-32). Geiser-Bates families to the present (Meyers 1989). While attending a sorority party, Elizabeth Geiser met John Montague Bates. She graduated from the University of Oregon and she and Bates married two years later (Bates 1989). Curtis Bates became manager of the Mortoramp Garage in Portland. John and Reese Bates continued development of garages where patrons could drive to their parking places. They eliminated elevators and lengthy waiting for parking or retrieval of cars. John M. Bates, a friend of Paul Cole Murphy, a longtime real estate developer who was then promoting the Dunthorpe and Forest Hills subdivisions of the Ladd Estate Company, turned to lands in Lake Oswego. Bates' parents had settled in the 1920s at the south end of the lake in a gracious bungalow on astunning lot on South Shore Boulevard. In the 1930s John and Elizabeth Bates purchased several lakefront lots nearby, a tract on Southwest Bryant Boulevard. They turned to their friend Wade Pipes in 1938 to design a country home, one suited for a rural setting on a waterfront lot in Lake Oswego. This structure at 16948 SW Bryant, erected in 1939, differed dramatically from the larger, more formal home Pipes had designed for them in the Portland Heights but three years before (Bates 1989; Anonymous 1942, 1944; Lockley 1928:431). during that conflict (Bates 1989). In the 1950s John and Elizabeth Bates were approaching their retirement years. Their interests were several. John Bates completed a term in the Oregon legislature in 1952 as joint representative of Clackamas and Multnomah counties. He was a Republican, member of the University Club, a Rotarian, and former chairman of the Multnomah County Red Cross. Bates also had served as a director of the Portland Rose Festival Association. He and his wife were originally members of Trinity Episcopal Church in Portland and subsequently of the parish in Lake Oswego. Elizabeth Bates was a founder of the Lake Oswego Garden Club, maintained an avid interest in botany, served on the committee to design the Japanese Garden in Washington Park in Portland, and was a master bridge player. The Bateses maintained a strong interest in gardening, a passion shared with Wade Pipes. John M. Bates served as president of the Oregon Chapter of the Oregon Rhododendron Society (Bates 1989; Capitol Publishing Co. 1948:48; Norman 1960-61:276). culmination of Pipes' architectural development" (Clarke 1985:56). 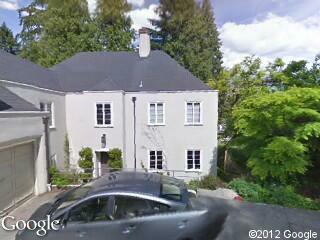 in Dunthorpe to the Bateses' home on Lake Oswego. John Bates on numerous occasions drove Pipes to projects he had designed or was planning. The two talked about design, landscaping, and a mutual enthusiasm for the Arts and Crafts Movement. These mutual interests led Pipes to design the dining table, chairs, sideboard, and sofas for the Bates retirement home as well as special treatments for bookcases, linen closets, and other features (Bates 1989). John Montague Bates died on May 1, 1975. His widow, Elizabeth, remained in the home in Lake Oswego until her death in June, 1989. The couple's sen, John Montague Bates, Jr., inherited the property and moved into the hcme in September, 1989 (Bates 1989).